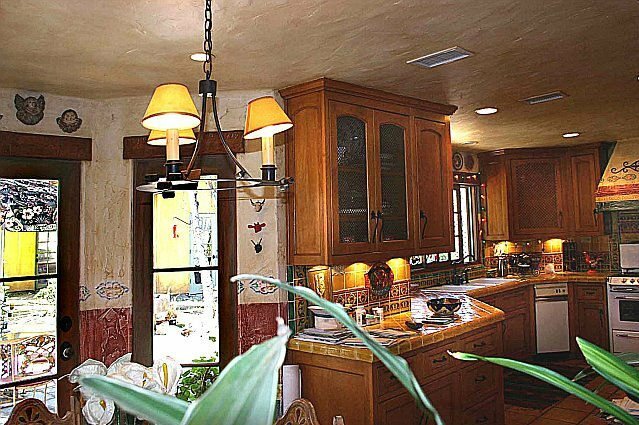 This stunning kitchen got a great lift using Mexican tile in the counter-top and back-splash. The counter-top features our Yellow Talavera Mexican Field Tile with accents at the center using sets of four Colima Talavera Mexican Tile. The edges are covered by Washed Yellow Talavera Clay V-Cap. The back-splash features Yellow Liz Flower Talavera Mexican Tile along the Green Quarter Round Trim 4 on top of it.